The Ryzen 7 1700 is the cheapest of the first AMD Ryzen CPUs and also now one of my favourites, and not just because I’m a financially-focused bread head. For me this is where AMD’s octa-core Ryzen 7 CPUs genuinely give Intel a bit of a headache when it comes to gaming chips, offering eight cores and 16 threads of processing power for less than the cost of a standard quad-core Core i7 7700K. 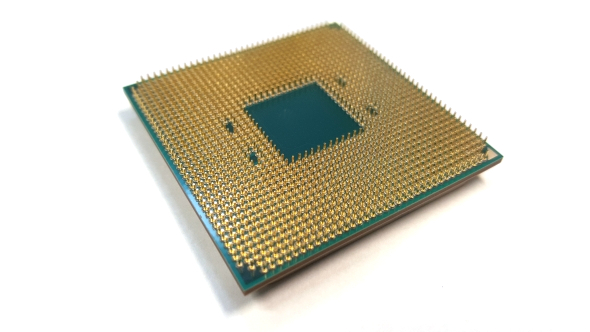 How much impact has Ryzen had on our CPU guide? 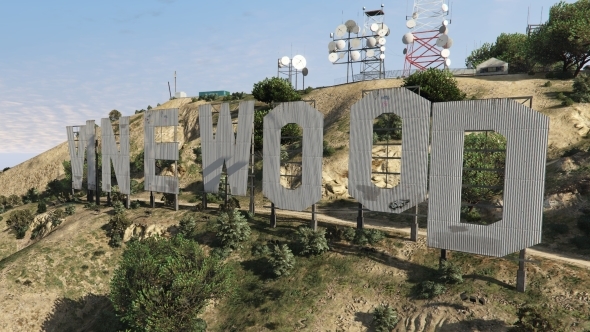 Check out our pick of the top gaming processors. 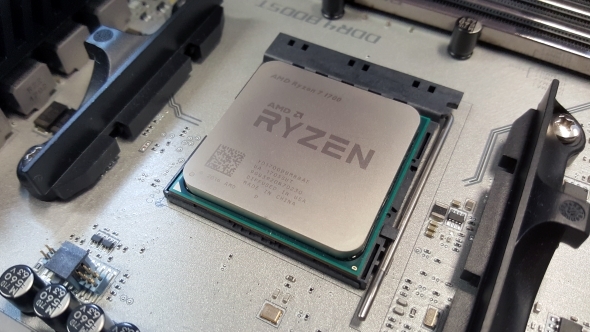 Its numerical compatriot, the Ryzen 7 1700X, sits slightly above this cheaper octa-core in terms of nailed-on clockspeeds and higher overclocking potential and makes the $500 Ryzen 7 1800X look rather irrelevant. But if you’re willing to take a punt on running the straight $330 (£305) 1700 overclocked then you get a really powerful multi-threaded chip for a great price. The R7 1700 is a very slightly different processing beast from its ‘X’ toting stablemates. The ‘X’ suffix denotes a Ryzen chip sporting the fullest implementation of AMD’s extended frequency range (XFR) which allows the CPU to dynamically boost its clockspeed (over its stated Turbo clocks) by another 100MHz if there is sufficient cooling headroom. Without that tag though the Ryzen 7 1700 doesn’t require the same level of thermal support, hence the chip’s 65W TDP. And yet, because of AMD’s more open approach to overclocking support, if you do have a decent cooler you can easily hit the same levels of performance with a little light overclocking. On the surface the ‘X’ suffix might seem a lot like Intel’s K-series, but it actually makes a lot less difference when you’re choosing which AMD CPU gets your vote. Where Intel locks the multipliers, and hence castrates non K-series chips’ overclocking potential, all the Ryzen processors are set to remain completely unlocked and overclockable. The only limits AMD is putting in place lie on the chipset side. The top-end X370 gets all the overclocking bells and whistling things, while the B350 still gets itself some OC capabilities too. The bottom rung of the AMD chipset ladder, the A320, doesn’t get any overclocking support at all. The stock clockspeeds for the Ryzen 7 1700 are inevitably the most conservative of the octa-core triumvirate. The somewhat miserly 3GHz base clock isn’t too much of a worry as, even with all cores filled with tasks, you’ll see the 1700 push itself beyond that arbitrary frequency – our sample stuck around the 3.2GHz mark at 1005 load. It’s peak single-core clock of 3.7GHz is more like it though, being only 100MHz behind the top speed of the 1700X. And that’s where the differences largely end, even compared with the $500 R7 1800X. 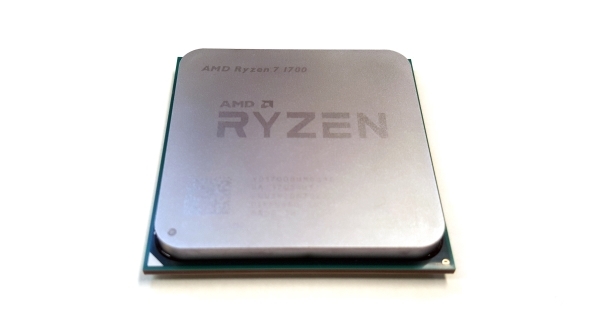 The Ryzen 7 1700 is still rocking SMT so it’s got the full thread-count of 16 and retains the same level of cache memory, the same number of PCIe 3.0 lanes and the same basic 14nm Zen core design. It is, to all intents and purposes, just a slightly down-clocked version of the full-fat 1800X. 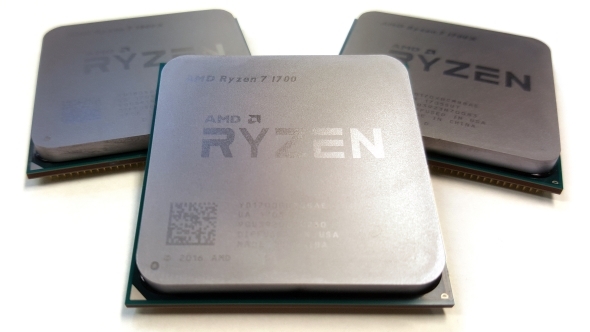 The drop in single and all-core clockspeeds is really all that’s responsible for the lower performance of the Ryzen 7 1700 against the other two AMD chips we’ve tested. It’s most obvious in the CPU-intensive benchmarks of Cinebench’s rendering and X264’s encoding tests. The single-threaded speeds are well down on the 1800X and a little behind the 1700X and the same rings true for its multi-threaded performance too. That said we’re still talking about Zen’s excellent multi-core performance here, with those 16 threads still capable of eating properly threaded applications for breakfast, second breakfast, brunch, lunch, tea, dinner and supper. AMD’s Ryzen chips are like the greedy hobbits of the productivity processor world. Even the very cheapest of AMD’s Ryzen 7 range can bat aside the otherwise competitive Core i7 6800K in these CPU-intensive tasks and is a long way ahead of the slightly more expensive quad-core, eight-thread i7 7700K in all but the single-threaded tests. As ever though it’s that single-threaded performance which makes the Intel Core design a more sensible choice from a straight gaming point of view. But with the extra productivity performance on offer, for around the same price as an Intel quad-core, the choice becomes a lot less clear cut for anyone looking to do anything else with their machine outside of simply gaming. The Ryzen 7 1700’s gaming performance also makes things tough for the other chips in the octa-core range. At stock speeds there really isn’t a lot between this lower-caste Ryzen 7 and the two ‘X’ chips, and when you level out the clockspeed differences via overclocking you can make that delta even smaller. In the overclocking stakes though you won’t quite get to the same levels as the more expensive Ryzen chips. Our 1700 sample tapped out at 3.9GHz and, with our basic overclocking, we couldn’t get it to hold stably at 4GHz. 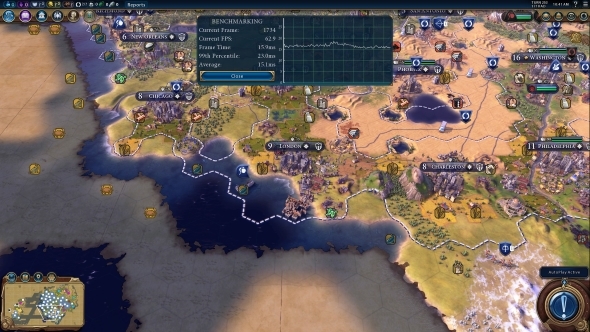 The 1700X managed to stick at 4GHz while the 1800X topped 4.1GHz. That said, the Ryzen 7 1700 runs noticeably cooler at 3.9GHz than the toasty 1800X at its overclocked peaks. Even taking into account the sensor discrepancy which artificially notes temperatures 20॰C higher on the ‘X’ chips the 1700 peaks at just 63॰C while the 1800X delivers an adjusted maximum temperature of 72॰C. The Ryzen 7 1700 is really what I was hoping for from the first octa-core Zen-based chips. It’s around the same price as Intel’s eight-threaded quad-core i7 7700K, if a little cheaper, and runs rings around it from a straight CPU performance point of view. Despite all the hype, hope and bluster AMD’s Zen cores were never going to best Intel’s single-threaded/gaming performance, but the 1700 is just as capable on that front as either of its bigger Ryzen brothers. 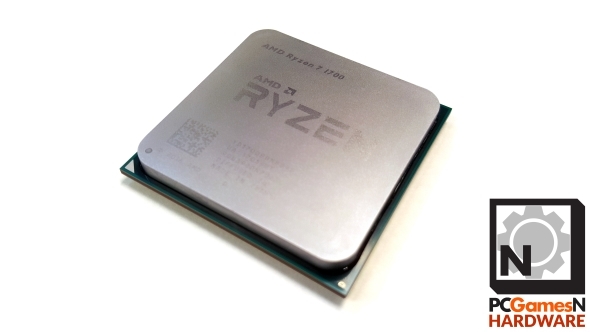 I’m still not going to recommend any of the octa-core Ryzens as the go-to processors for gamers purely looking to get the highest frame rates out of their graphics silicon, but with the combination of price and multi-threaded performance the twin 1700 and 1700X CPUs bring high-end desktop productivity down to a truly unprecedented price point. And if you’re likely to spend as much time rendering or encoding as you are gaming then the Ryzen 7 1700 really is a tough one to beat. You do though need to run the Ryzen 7 1700 in an overclocked state to be able to get the best balance of performance out of it, and that will possibly limit the lifespan of the chip. Because Zen is still only a very new processor design we can’t really speak to the longevity of the hardware, especially when it’s being run outside its stock parameters, but considering the temperature of the 1700 stays relatively low I’m not hugely worried. If you are though, and when you’re still spending over three hundred clams on a slice of silicon that’s understandable, the Ryzen 7 1700X might well be a better pick.